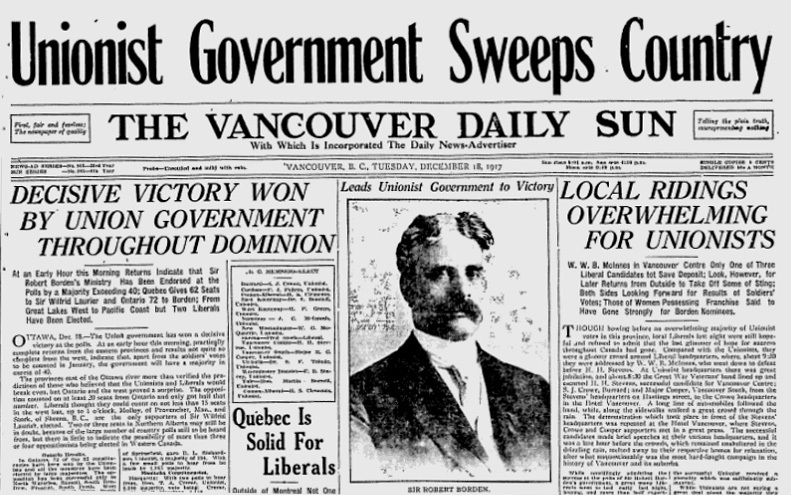 For Canadians, the federal election of 17 December 1917 divided the nation and transformed the political, social, and cultural landscape for generations to come into two solitudes. It saw "Laurier’s loyalists and Bourassa’s nationalistes" pitted against a powerful English-speaking Unionist coalition in a bitter contest that J.L. Granatstein has judged as "more viciously racist than any election in Canadian history." Journalist Sandra Gwyn similarly described the "Khaki Election" as "more like a civil war than an electoral contest," one in which, for example, readers of the Manitoba Free Press had been exhorted to "make every ballot a bullet." It was an enormous gamble, but for Borden it paid off, at least in the short term. His Unionists swept to a fifty-seven-seat majority, which expanded to a remarkable seventy-one seats when the soldiers’ votes were officially tallied in Canada on 1 March. Indeed, about 95 percent of the CEF voted in favour of a Union government, and thus for conscription as well. Hence, just before leaving on holiday, Borden issued instructions that the first conscripts should report for overseas service on 3 January 1918. Reluctant Warriors: Canadian Conscripts and the Great War.